Erik Solheim, chair of the Organisation for Economic Co-operation and Development’s Development Assistance Committee, speaks at the University of Ottawa on Jan. 13. The leader of a main group of aid donors says Canada’s new government should set a path to boost aid to reach international standards. Erik Solheim, chair of the Organisation for Economic Co-operation and Development’s Development Assistance Committee, said the new Liberal government should continue with the former Conservative government’s focus on leveraging private-sector investment in developing countries, and go further. 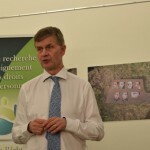 If Britain’s Conservative government can hit—during tough economic times—the global gold-standard of 0.7 per cent of gross national income spent on foreign aid, then Canada can do it too, said Mr. Solheim, speaking during a visit to Ottawa on Jan. 13. “No one expects Canada to go to 0.7 tomorrow. A trajectory of gradual increase is feasible,” he said. Canada languished at 0.24 per cent in 2014 according to the OECD-DAC, or $4.2 billion USD. No major political party during last fall’s election campaign would produce a firm timeline to reach that goal, though the NDP said they’d get to it eventually. At a time when both Canada and the world are starting a new chapter of international development policy priorities, Mr. Solheim suggested niches Canada could lead on. With the world focusing for the next 15 years on achieving 17 new Sustainable Development Goals announced last year, Mr. Solheim suggested, Canada’s new government could take the lead on Goal 14 for instance, to conserve and sustainably use oceans and marine resources. He also spoke of the health of mothers and children: Canada’s top aid priority for the last six years, one the Liberal government has deemed a valuable focus, with some tweaks. And he mentioned fragile states; Aid Minister Marie-Claude Bibeau has been tasked with focusing Canada’s aid on the poorest and most vulnerable as well as supporting fragile states. While in Ottawa, the former Norwegian international development and environment minister also spoke alongside the author of a new book on his and other Norwegian government officials’ efforts in the early 2000s to end the Sri Lankan civil war. Mr. Solheim was the lead negotiator from 2000 to 2005 shuttling between the Sri Lankan government and independence-seeking Tamil minority rebels. The ultimate goal of peace in the decades-long conflict wouldn’t come until after the government finally crushed the rebels in May 2009 in a bloody military campaign that left thousands of civilians dead. A new government came to power in Sri Lanka last year and co-sponsored a resolution on itself at the United Nations Human Rights Council recognizing the need for truth, justice and reparations after the war. Mr. Solheim spoke to Embassy after the book launch of To End a Civil War with author Mark Salter, presented by the University of Ottawa. The following are excerpts from Mr. Solheim edited for style and length. “[Priorities] must come from the side of Canada, not from [our] side. I suggested one area as an example. The Sustainable Development Goal 14 is about oceans. There’s no clear owner of that goal. You need to set the policies right. And Canada has the longest coastline of any nation on the planet. It is well placed to lead on that. “But there are so many other areas. “You have always played a role on women’s issues and maternal health. That’s another area where Canada can potentially lead. “There’s a strong desire to be effective on climate, but oceans is a key [part] of climate. “Fragile states, we need nations who can really lead on some of the most difficult fragile states, like South Sudan, Central African Republic, Haiti and many others. “No one can lead everywhere. But Canada can lead somewhere. “You need a lot more both private sector investment and aid. There’s no contradiction. No one should argue that you should do aid and not private sector investment, or vice versa. We need both. “The private sector can never pay for education in Central African Republic. But, on the other hand, if you want to build a hydroelectric power plant or solar plant, it might be better to make it a commercial entity and assist the private sector in doing it. For sure, you need both. “It should embrace the new government. It should engage with Sri Lanka at all levels. It should increase investment, encourage tourism, and in all ways engage with Sri Lanka. “I think it’s a good start. But there [is] more to be done. “There must be a full stop in all sorts of violence. Still there are cases where people have been disappearing and who have been raped; that must stop.